Other equipment (not included in the List) (subscriber equipment, mobile phones, modems, cables, GPON, VoIP, antennas, etc. ), should get declaration of conformity. Certification of WiFi router (access points), Base stations (BTS), satellite earth stations, microwave, SDH, DWDM, etc. Qualified experts of Certification Center with long term experience in telecom certification in Russia are ready to provide all support for obtaining all necessary certification/declaration documents and its registration by the Federal Communications agency. Federal Law “On Communications” 7.07.2003, No 126-ФЗ. "Procedures and rules of mandatory conformity assessment of telecom equipment", Approved by the RF Government decree of 13.04.2005 N 214. 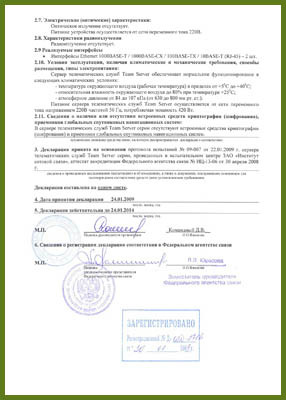 "List of equipment for mandatory certification", Approved by the RF Government decree of 25.06.2009 г. N 532. 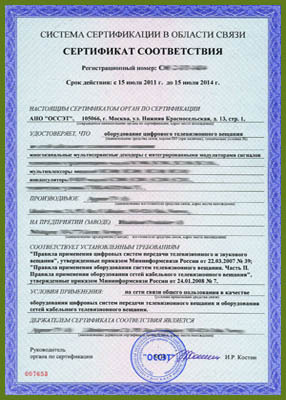 Declaration of conformity can be submitted only by the Russian legal entity. The foreign manufacturers should provide the agreement with the local representative, responsible for the equipment safety. Registration fee for the declaration of conformity is 3500 rubles. Providing test reports done for any international certification system it will help to reduce the cost end duration of certification.